She looks SO different after being rescued. 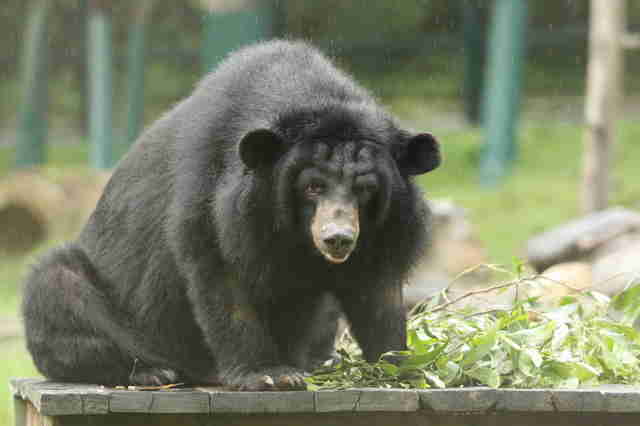 For eight long years, Miracle lived a moon bear’s version of hell. 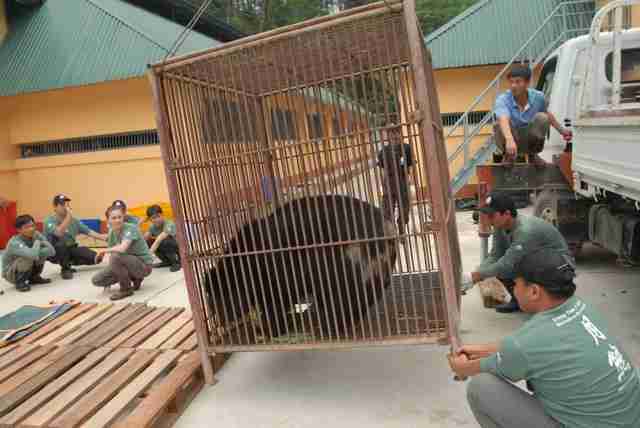 Locked inside a tiny metal cage at a bear bile farm in Vietnam, likely since she was a cub, Miracle existed for one purpose — so people could extract her bile, which is a prized ingredient in traditional Chinese medicine. Bile is a digestive juice produced in a bear’s liver and stored in the gallbladder, and people usually extract the bile through an open wound in the bear’s body. Every time the bile is taken out, with a large needle, the animal can feel a tremendous amount of pain, according to Animals Asia. It’s also common for bacteria to be introduced in the bile extraction process, which can cause dangerous infections. Bears at these farms spend their lives in rows of dark cages — many of them never see the sun, and they barely have room to turn around. While no one will ever know exactly what Miracle went through, her body told a story of agony — not only did she have an unhealthy gallbladder, but Miracle’s head was dotted with rough calluses, which formed after years of rubbing her head against her cage. 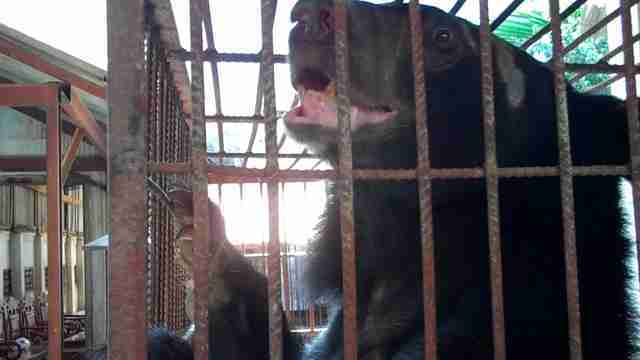 Bear bile farming has been outlawed in Vietnam since 1992, so the bile farm that Miracle came from had been operating illegally. 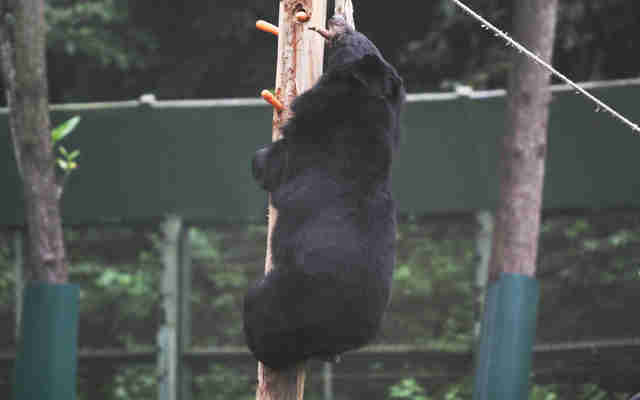 In 2007, wildlife officials confiscated Miracle from the bile farm, and she was transferred to a government-run rescue center while she waited for a team from Animals Asia to bring her to its bear rescue center in Tam Dao National Park. 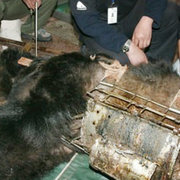 While Miracle’s bile wasn’t being extracted at the rescue center, animal photographer Jo-Anne McArthur, who accompanied the Animals Asia team to pick up Miracle, remembers the bear being highly stressed in her small cage — so stressed that she swung her body back and forth in a neurotic manner. The Animals Asia team ended up transporting Miracle in the same cage to the sanctuary, which was about a two-hour drive away. The transportation process would have also been stressful for Miracle, but when she arrived at the sanctuary staffers saw something that made them hopeful she could be happy again. “She could see cubs across the hall in a neighboring room, and soon she began making mothering sounds," McArthur said. "She really wanted to get to those cubs. 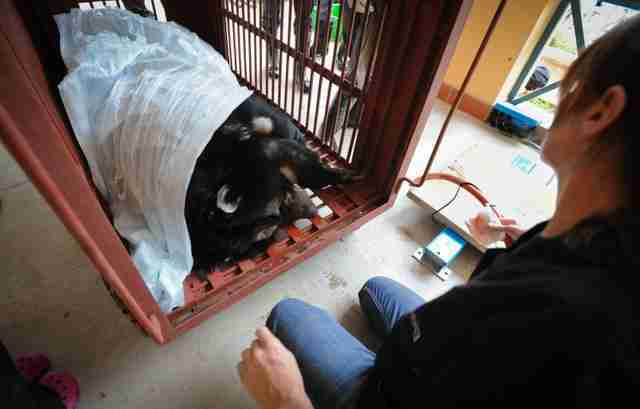 It was during those initial weeks after her rescue that she really started to calm down." Before being released into her new enclosure, Miracle had to have a cholecystectomy to remove her gallbladder, which had been badly damaged from years of bile extraction. But after she recovered from her surgery, Miracle had all the room she wanted to run and swim and play in her sanctuary enclosure. Three years later, McArthur visited Miracle again at the sanctuary, and she couldn’t believe what she saw. “The calluses were gone,” she said. 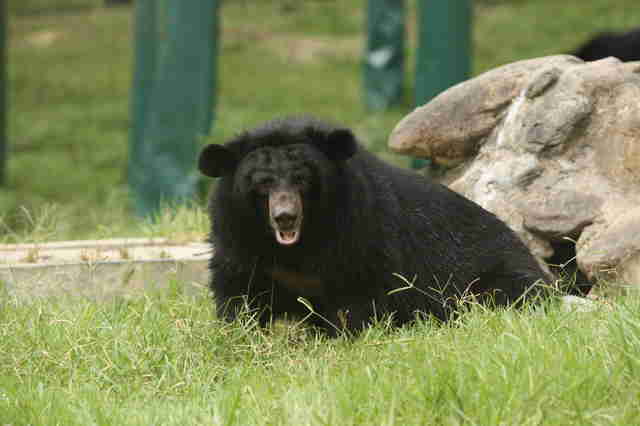 McArthur said she particularly enjoyed seeing Miracle and the other resident bears go about their daily routines. In 2012, Miracle unfortunately passed away from peritonitis, an inflammation of the inner abdominal wall, which was probably the result of years of bile extraction. But Miracle certainly enjoyed the last remaining years of her life. 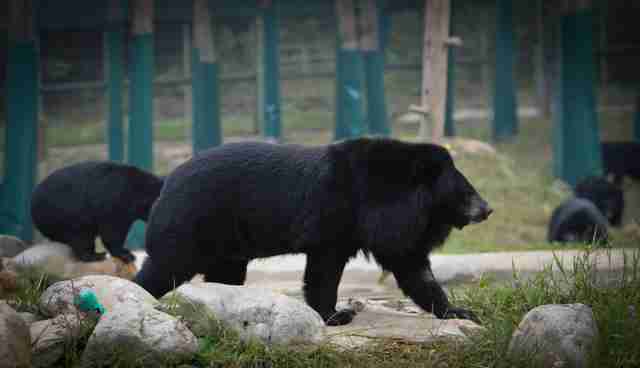 UPDATE: McArthur has clarified that Miracle did not become calm as soon as she saw the cubs, but in the weeks after. The story has been updated to reflect this. 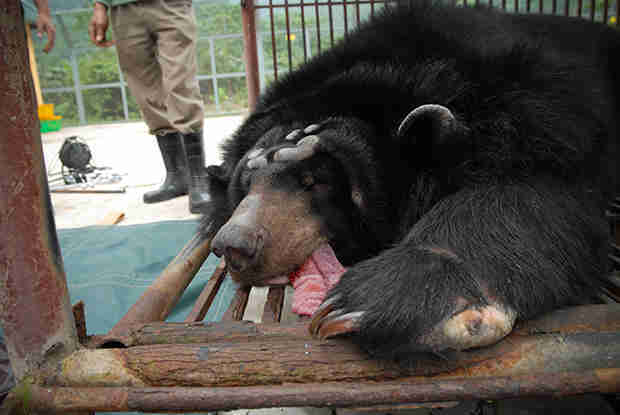 More than 10,000 bile bears are kept on farms in China alone, according to Animals Asia. 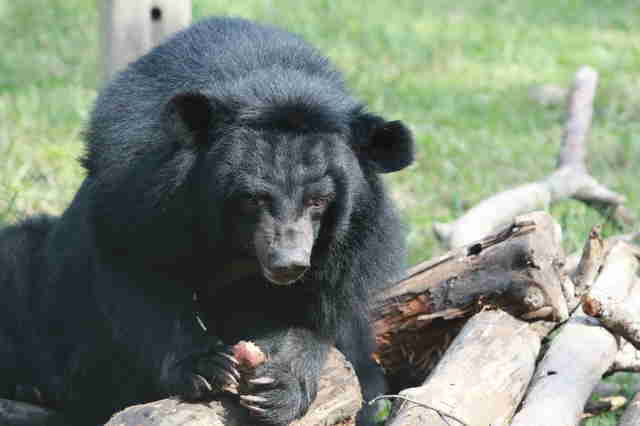 To help stop the trade — and provide for bears like Miracle who have been rescued — you can make a donation.